Equisetum arvense also known as field horsetail or common horsetail is an herbaceous perennial plant in the Equisetaceae (Horsetail family). The plant is native throughout the arctic and temperate regions of the northern hemisphere mostly North America, Europe, the Middle East, and parts of Asia. There are around 20 species of horsetail that can be found almost everywhere in the world, except in Australia, New Zealand, on several islands in the Pacific Ocean and on Antarctica. Some of the popular common names of the plant are bottle brush, bottlebrush, bull pipes, common horsetail, corn horsetail, field horsetail, foxtail, foxtail rush, foxtail-rush, horse pipes, horsetail, horsetail fern, joint grass, joint weed, mare’s tail, meadow pine, meadowpine, paddock-pipes, pine grass, pine-grass, rush, scouring rush, shave grass, shavegrass, snake grass, snake-grass and western horsetail. Horsetail got its name due to its resemblance to the tail of a horse. 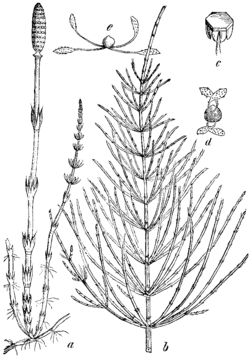 The scientific name Equisetum is derived from the Latin equus meaning horse and seta meaning animal hair and describes the stiff stalks of the horsetail. The species name arvense comes from the Latin word arva which means field. The English name Field Horsetail is thus a direct translation from the Latin. It is a vascular plant that is closely related with ferns. 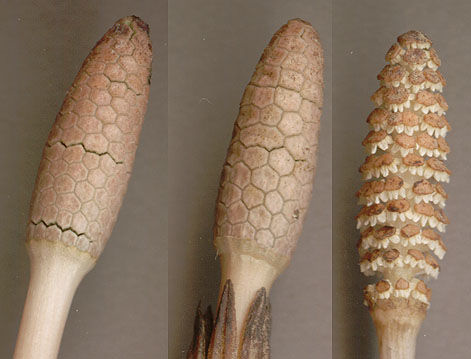 Horsetail does not have flowers and does not produce seed. It reproduces via spores that are produced in the sporangium (cone shaped organ), located on the top of the plant. 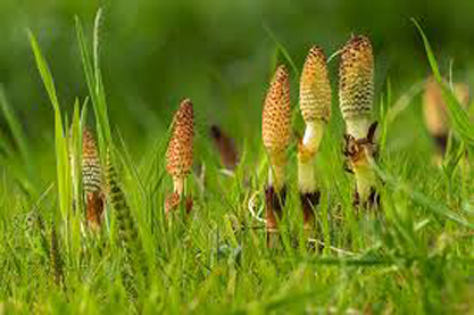 Horsetail is an herbaceous perennial plant that grows about 1-2 feet tall. Largest species of horsetail can reach 6 feet in height. The plant is found growing in non-sandy savannas and sandy savannas, black soil prairies, sand prairies, gravel prairies, dolomite prairies, prairie remnants along railroads, thickets, fens, seeps, ditches, roadsides, open areas along railroads (including the gravel ballast), old fields, and waste areas. The plant prefers neutral or slightly basic clay loams that are sandy or silty, particularly where the water table is high, though it can occur occasionally on slightly acid soils. The plant has a deep root system. The stems are mostly upright (i.e. erect or ascending) but can occasionally trail along the ground at first before turning upwards (i.e. occasionally decumbent). These stems are noticeably jointed and are of two distinct types. Most of the stems are “vegetative” (i.e. sterile). These are green in color and are about 5-60 cm tall and 1.5-5 mm thick with small cup-shaped sheaths at their joints (i.e. nodes). They are hollow, grooved lengthwise (i.e. longitudinally), and produce groups (i.e. whorls) of thin branches (8-15 cm long and about 5 mm thick) that are sometimes mistaken for leaves. These branches are four-angled and usually emanate from each of the stem joints (i.e. nodes). The sheaths are actually the reduced, scale-like, leaves. They are green to dark-brown in color, borne in clusters of 6-18, and are fused together to form a small cylindrical or cup-shaped structure (5-8 mm long) topped with teeth that are 2-3 mm long. The second type of stem is whitish or pale brown in color, shorter and somewhat thicker up to 30 cm tall and 8 mm thick. These are known as “fertile” stems and bear reproductive structures at their tips. They are jointed and sheathed like the vegetative stems but lack the whorls of green branches. Being closely related to the ferns, this plant does not produce true flowers or seeds. Instead it produces spores in a cone-like structure known as a strobilus. These structures (i.e. strobili) are borne at the tips of the ‘fertile’ stems and commonly appear during early spring, before the ‘vegetative’ (i.e. sterile) stems. They are greenish, whitish or brownish in color about 1-4 cm long with numerous stalked scale-like structures (i.e. sporangiophores) which bear the spores. The masses of minute spores are pale greenish to yellow in color. Horsetail is an effective, safe, and reliable treatment of rheumatoid arthritis. It improved symptoms and regulated the immune response in most patients with rheumatoid arthritis (RCT). Horsetail reduced inflammation, which may be crucial for treating this disease. 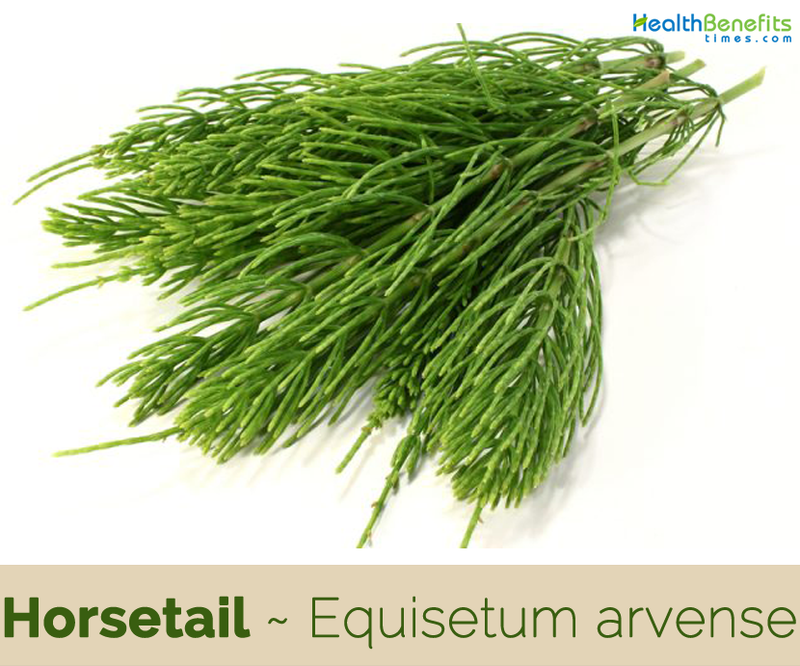 Horsetail relaxes blood vessels, and reduced blood pressure in people with heart disease. Dicaffeoyl-meso-tartaric acid is the active ingredient in this process. It helps to reduce fat oxidation, which is often the fundamental cause of heart disease. Horsetail has been used to help heal wounds faster. Horsetail ointment is commonly applied directly to the wound. Excessive bleeding is common to heavy menstrual periods, hemorrhoids, and ulcers. Horsetail helps to treat wounds and shrink their size and may help to treat these conditions too. 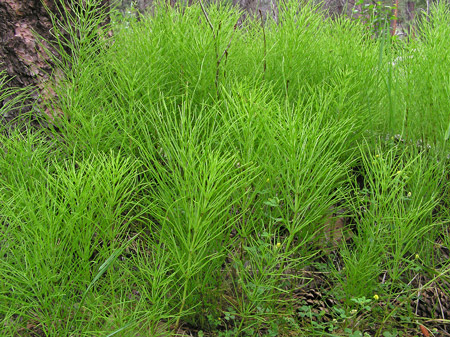 Horsetail displays potential for treating skin, blood, and lung cancer based on cell studies. 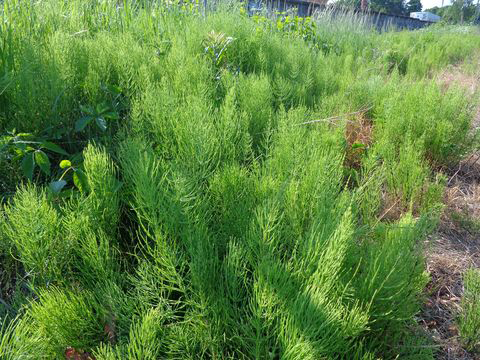 Horsetail reduced growth, inflammation, and damage in human cancer cells. Antioxidants in horsetail are the main components in fighting cancer, while zinc in horsetail can boost the anti-tumor effect. Horsetail ointment helps to reduce pain in a research with 108 healthy women shortly after giving birth. Half of them used horsetail ointment on a surgical wound for 10 days. Horsetail extracts reduced pain and inflammation. 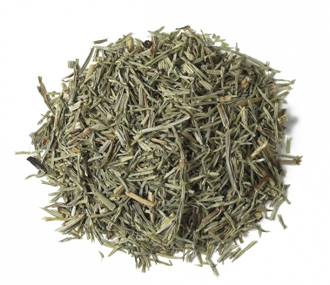 Horsetail tea is a proven way of relieving many respiratory conditions such as a cold or flu. People who frequently suffer from congestion or experience breathing discomfort should frequently consume horsetail tea. Since the herb is rich with expectorant properties; the use of horsetails clears out mucus and phlegm to promote a good respiratory function. It is also effective in relieving inflammation and cures a persistent cough. Hemorrhoids are painful and cause significant discomfort. To relieve your symptoms and to cure hemorrhoids the natural way, use horsetail supplements in the form of liquid or tea before every meal guarantees improved results. However, make sure you include a good amount of fiber in each meal. Horsetail helps to maintain good nail health. Regular use of horsetail guarantees stronger and longer nails. Just add two teaspoons of dried horsetail in boiling water. Let it cool for 10 minutes and soak your nails in this solution for at least half an hour. Use this remedy at least 3-4 times a week to observe noticeable differences. Horsetail extract is commonly used to treat a weak bladder. Hence, it is a common remedy that is helpful in treating bladder incontinence along with many kinds of urinary tract infections. To naturally treat a UTI infection, consume one capsule of horsetail extract twice a day. It is also used to support good health and proper functioning of the kidney to prevent kidney stones. Moreover, it is also helpful in preventing the formation of gallbladder stones. 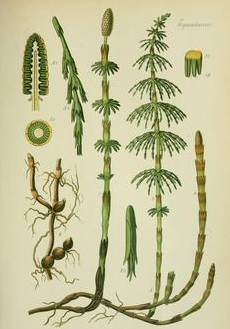 Native Americans and early settlers used tea made from field horsetail as a diuretic. Field horsetail was used as a cough medicine for horses. Externally it was traditionally used for chilblains and wounds. It has been used in traditional Austrian medicine internally as tea, or externally as baths or compresses, for treatment of disorders of the skin, locomotor system, kidneys and urinary tract, rheumatism and gout. It is very astringent and makes an excellent clotting agent, staunching wounds, stopping nosebleeds and reducing the coughing up of blood. It helps speed the repair of damaged connective tissue, improving its strength and elasticity. Plant is anodyne, anti-hemorrhagic, antiseptic, astringent, carminative, diaphoretic, diuretic, galactogogue, haemostatic and vulnerary. Plant is a useful diuretic when taken internally and is used in the treatment of kidney and bladder problems, cystitis, urethritis, prostate disease and internal bleeding, proving especially useful when there is bleeding in the urinary tract. Decoction applied externally will stop the bleeding of wounds and promote healing. It is especially effective on nose bleeds. Decoction of the herb added to bath benefits slow-healing sprains and fractures, as well as certain irritable skin conditions such as eczema. It is used in the treatment of cystitis and other complaints of the urinary system. Fresh herb can be bruised and applied to wounds to stop bleeding. 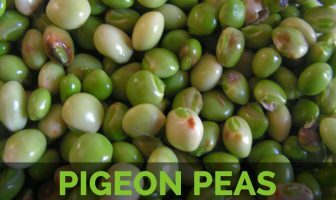 It has also been used to treat deep-seated lung damage such as that caused by tuberculosis or emphysema. It encourages calcium absorption and helps fight against plaque deposits in the arteries. Ashes of the plant are considered very valuable in acidity of the stomach, dyspepsia, etc. It is of efficacy for hemorrhage, cystic ulceration and ulcers in the urinary passages. Decoction applied externally will stop the bleeding of wounds and quickly heal them, and will also reduce the swelling of eyelids. Decoction taken in wine helps stone and strangury. Distilled water drunk two or three times a day eases and strengthens the intestines and is effectual in a cough that comes by distillation from the head. It is also used for balding, tuberculosis, jaundice, hepatitis, brittle fingernails, joint diseases, gout, osteoarthritis, osteoporosis, frostbite, weight loss, heavy menstrual periods and hemorrhage of the nose, lung, or stomach. Horsetail is applied directly to the skin to treat wounds and burns. Blood Clots: Mix two tablespoon of Horsetail juice in water. Have it once a day. Pericarditis: Boil half teaspoon dried Horsetail in a cup of water. Strain. Have thrice a day. OR Boil 100 gram of dried Horsetail in 3 liter of water. Mix it in your bathing tub. Soak yourself in tub for 15 minutes daily. Brittle Nails: Grind the dried Horsetail. Put one tablespoon of powdered Horsetail in a cup of hot water. Let it steep for 15 minutes. Soak the nails in lukewarm solution for 15 to 20 minutes. Repeat the process daily and do not forget to apply good carrier oil over the nails. Gluten allergy: Prepare a tea, made of dried Horsetail herb and one cup of hot water. Drink it once a day. Interstitial Cystitis: Boil half teaspoon of dried Horsetail herb in one cup of water. Have it twice a day. Ricket: Take 1 teaspoon of dried Horsetail and boil it in water for 10 min. Drink this tea once in a day. It enhances the strength of the Bones. Frozen Shoulder: Boil 1 tablespoon of dried Horsetail in water. Drink this tea 2 times a day. Fracture: With this cup of tea calcium supplement is also needed. Prepare a decoction of 4 table spoon of Horse tail grass, 3 tablespoon of comfrey root, 2 parts of oat and 1 part of lobelia. Have two cups two times a day. Brittle nails: Take powdered Horsetail. Put a tablespoon of powder in a cup of hot water. Cover the cup and leave it for 15 minutes. Let it lukewarm. Soak the affected nails in the solution for 15 minutes. Pat dry the nails. Now, take a tablespoon of Olive Oil and slightly warm it. Add half tablespoon juice of Lemon in the oil. Apply the mixture on nails and wrap the nails with soft cloth or cotton. Leave it overnight. Repeat the process daily to get over from Brittle Nails. 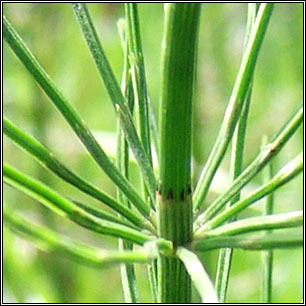 Horsetail provides adequate amount of Silica which builds the nail health. Olive Oil improves the thickness of the nails. Lemon fights with free radicals and also prevents the future damage. Young shoots were eaten either cooked or raw. Buds are eaten as a vegetable in Japan and Korea in spring time. Some native tribes liked to eat the young vegetative shoots, picked before they had branched out, and would often collect them in great quantity then hold a feast to eat them. Leaf sheaths were peeled off and the stems eaten raw. Black nodules attached to the roots are edible. Peeled stems, base of the plant, root and tubers were eaten raw by the N. American Indians. 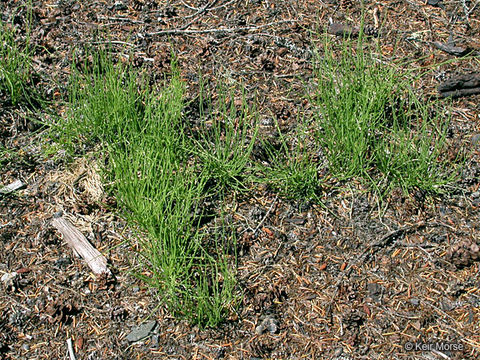 Field horsetail is a common food item consumed by grizzly bears. Dyes for clothing, lodges, and porcupine quills were made from field horsetail. It was used for scouring and polishing objects. It was also once used to polish pewter and wood and to strengthen fingernails. It was used by hurdy-gurdy players to dress the wheels of their instruments by removing resin build up. Stems contain 10% silica and are used for scouring metal and as fine sandpaper. They can also be used as a polish for brass, hardwood etc. Infused stem is an effective fungicide against mildew, mint rust and black spot on roses. Light pink dye is obtained from the stem. Plant has been used for making whistles. Dried stems were used to polish pewter and other metals. Excessive amounts (more than 20 percent) in hay can cause scours, paralysis, and death in horses. Large quantities of the plant can be toxic. Avoid in patients with edema due to heart failure or impaired kidney function. Plant contains irritant substances and should only be used for a short period (two months at max in one go). Pregnant, lactating moms and kids below the age of six should totally avoid horsetail because of its high nicotine content. Long term use may cause kidney Irritation. If you are on any other supplements or medication, it is better you consult your doctor before using Horsetail. Those having a vitamin B deficiency or alcoholics should completely avoid Horsetail because of the presence of thiaminase enzyme, whose overdose destroys thiamine. People with high blood pressure or heart problems should not take horsetail. Horsetail shouldn’t be taken internally for more than three days. Mild side effects include diarrhea, upset stomach, and increased urination. Severe side effects that may require medical attention are kidney pain, lower back pain, pain while urinating, nausea, or vomiting. Heart palpitations can occur if horsetail is overused.